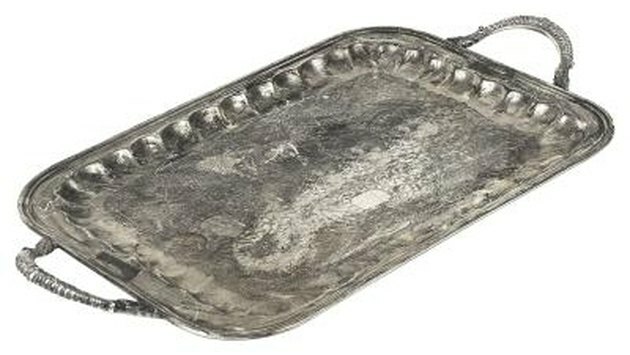 Distinguished for their versatility, dent-resistance and brilliant shine, hand wrought aluminum trays are prevalently used for serving foods and beverages. Metalworkers often engrave intricate designs and lettering into hand wrought aluminum trays for aesthetic appeal. Like all metal items, aluminum trays eventually become dirty and drab from the accumulation of food particles, beverage spills and stains. 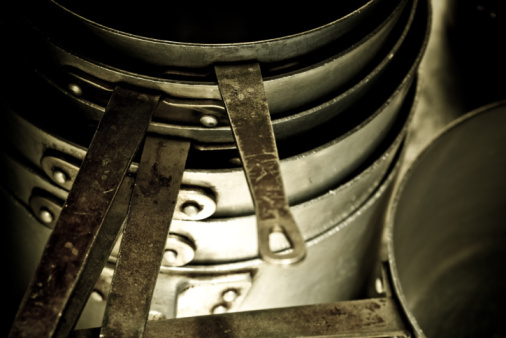 Regularly cleaning hand wrought aluminum trays preserves their beauty and extends their lifespan. Clean hand wrought aluminum with care, just like any aluminum. Abrasive food debris can scratch hand wrought aluminum trays. Wipe the sudsy dishrag over the entire tray. With each wipe, rinse the dishrag under fresh, flowing water to discard accumulated crumbs and grime. Moisten the second dishrag with warm water. Using the dishrag, wipe the entire tray to rinse away the soapsuds and film. Examine the tray for white stains from mineral deposits. If the tray contains white stains or is dull, boil a mixture of 1-cup white vinegar and 1-cup water in a pot. Pour the hot vinegar solution into the tray, thoroughly covering the white stains. 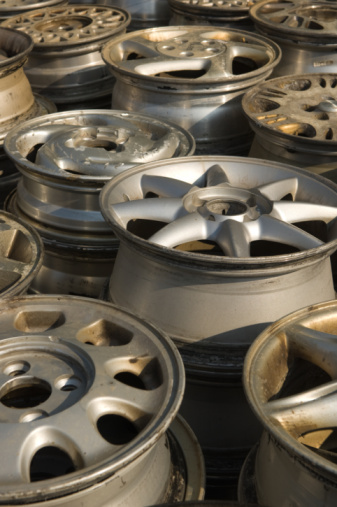 Boiling vinegar dissolves mineral stains and brightens dull aluminum. Let the hot vinegar mixture soak in the aluminum tray for one hour. Dump the vinegar mixture out of the tray. Wipe the tray with the third water-dampened dishrag to rinse off the vinegar mixture. Wipe the entire tray with a dishtowel until the aluminum is dry.